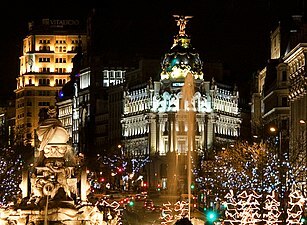 The plaza is a landmark of Madrid and it is famous for the Cybele Palace (City Hall), and the fountain of the same name. The Plaza de Cibeles is a square with a neo-classical complex of marble sculptures with fountains that has become an iconic symbol for the city of Madrid. It sits at the intersection of Calle de Alcalá (running from east to west), Paseo de Recoletos (to the North) and Paseo del Prado (to the south). Plaza de Cibeles was originally named Plaza de Madrid, but in 1900, the City Council named it Plaza de Castelar, which was eventually replaced by its current name. It is currently delimited by four prominent buildings: the Bank of Spain, the Palacio de Buenavista, the Palace of Linares ("Palacio de Linares"), and the Cybele Palace ("Palacio de Cibeles"). These constructions are located in four different neighbourhoods from three different adjacent districts: Centro, Retiro, and Salamanca. Over the years, Cybele Palace and her fountain have become symbolic monuments of the city. The fountain of Cybele is found in the part of Madrid commonly called the Paseo de Recoletos. This fountain is named after Cybele, a Phrygian goddess. The most prominent of the buildings at the Plaza de Cibeles is the Cybele Palace (formerly named Palace of Communication), which is the seat of the Madrid City Council. ^ "Plaza de Cibeles | Spain.info in English". Spain.info. Retrieved 2012-06-13. ^ "Madrid's Palacio de Cibeles Renovated Into Jaw-Dropping CentroCentro Cultural Center | Inhabitat - Sustainable Design Innovation, Eco Architecture, Green Building". Inhabitat. Retrieved 2012-06-13. 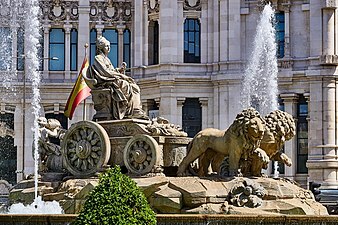 ^ "Cibeles Fountain - Tourism in Madrid". Turismomadrid.es. Archived from the original on 2012-12-18. Retrieved 2012-06-13. 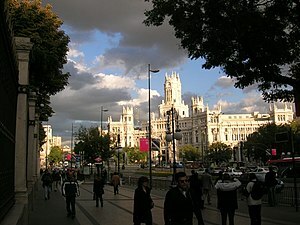 Wikimedia Commons has media related to Plaza de Cibeles, Madrid. This page was last edited on 10 March 2019, at 16:05 (UTC).